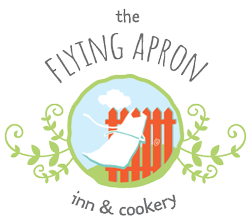 "You don't have to travel to Tuscany for an amazing culinary experience, it's all available at The Flying Apron." ~ Nicole Robinson, host of Nova Scotia's BEST Stay, eat, cook, learn, appreciate and relax. Do it all here. Honest, local and seasonal fare is what you’ll find on our ever-changing menu. A dining atmosphere most often described as “happy”, our warm and welcoming dining room is the perfect spot to celebrate local food. 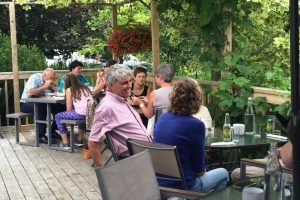 Our patio provides a picturesque setting in which to enjoy your meal while watching the resident chickens meander through the gardens. Relax into freshly pressed sheets and drift off to a frog pond serenade. Our well-appointed guest rooms provide the perfect retreat for an evening or an entire vacation. Learning never tasted so good! Sit back and watch our Chef at work or roll up your sleeves and cook along. Participate in one of our local producer tours to see first-hand where our food comes from and then return to our classroom to learn how to prepare the fresh harvest. Leave with a full belly, new recipes to try at home and new friends!